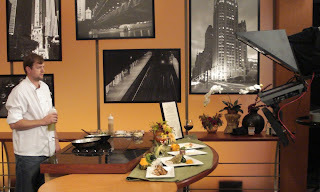 This past week has been fantastic at Kurman Communications; Eve (840 N. Wabash, Chicago; 312-266-3383) opened for lunch to rave reviews and fantastic coverage (if we do say so ourselves!) in JuliB, Thrillist, UrbanDaddy and Daily Candy - just to name a few. 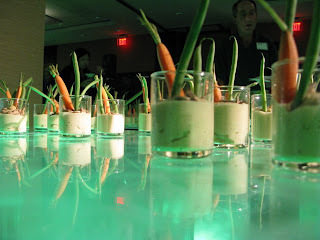 The Crowne Plaza Glen Ellyn-Lombard (1250 Roosevelt Road, Glen Ellyn, IL; (630) 629-6000) celebrated the launch of their green hotel with a fabulous Wizard of Oz-themed bash (read more about it here! ), hundreds of guests, and the presidents of both villages arriving to cut the ribbon. October may be finished, but we are still super busy with lots of treats up our sleeves. 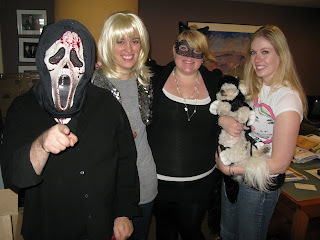 Halloween is truly one of the best holidays - when else can you dress up like someone (or something) entirely different, get away with strange fashions or fun wigs, and eat sweet upon sweet? Not to mention, this is probably one of the most gorgeous Halloween's Chicago has seen in about 38 years! 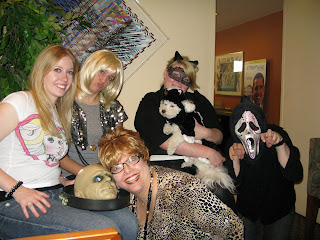 We at Kurman donned our Halloween best and decided to pose for some shots to show you all how we rock it on this holiday. Thanks in part to "Mom" (Cindy Kurman) we made sure to get some great shots. Even Truffle decided to let his hair down for the day - the usually deliciously-scented bichon came to the office as a skunk, and did so still smelling lovely. 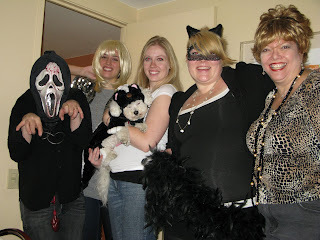 Check out Truff-the-Skunk and Cindy "Mom" Kurman, Lee "Scary Scream-Guy" Barrie, Stephanie "Barbie Doll" DeMeester, Catherine "Eizer You IN o' OUT" Patterson and Brittany "Glamour Cat" Bellgardt. Happy Halloween - it's back to work! Tell Dorothy that the next time she gets swept up for OZ, she should first check in at The Crowne Plaza Glen Ellyn - Lombard, a brand new, gorgeously renovated "green" hotel. Located in the heart of Chicago's lovely Western Suburbs, The Crowne Plaza Hotel Glen Ellyn-Lombard is a chic and modern hotel, offering guests the latest in room technology, comfort and hospitality. 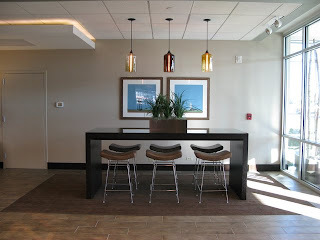 The Crowne Plaza Glen Ellyn has also made many efforts to be a "green" hotel, with environmentally conscious construction and insulated low-E glass windows, hybrid guest transportation, high efficiency plumbing fixtures, and sun shade and sun screens. On Tuesday October 28 the Crowne Plaza Hotel Glen Ellyn - Lombard hosted a fantastic event celebrating the grand opening of the hotel and restaurant, Glen Prairie. 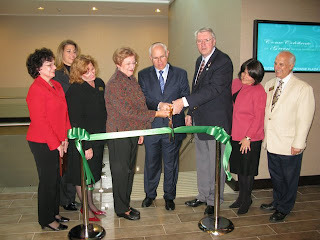 Hundreds of guests arrived just as the sun was setting to witness the celebratorial cutting of the green ribbon by Vicky Hase, Glen Ellyn Village President; David Friedman, president of F & F Realty; and Bill Mueller, Village President of the Village of Lombard. Guests dined on appetizers prepared by Glen Prairie Executive Chef Ovanin, Dine Executive Chef Chris Turano, Karma Chef Robert Packer, and Birch River Grill Chef John Ayaleanos, and sipped specially prepared cocktails, including the Glen Prairie Cooler and a Green Martini. A tour around the hotel began with a map, inspired by the film, The Wizard of Oz. Guests wandered throughout the 119 room hotel, stopping in to see the fantastic technology and space available in Meeting rooms, and viewing the ceder-planked arched ceiling enclosing the once-outside, now-indoors pool (you can still smell the cedar). Guests arrived at the Frank Lloyd Wright-inspired Glen Prairie restaurant, a gorgeous spot serving up comfort food with upscale twists (think: Bison Ribeye, Meatloaf with Crimini Mushroom Gravy, and Chervil Crusted Wisconsin Northern Pike served with Mac 'n' Cheese) with a focus on local family farm food sources. Many of the items on the menu actually list the name of the farm from which it came - perhaps to know where to send that thank-you once you finish your amazing meal. The evening ended with a jaw-dropping entrance; guests passed a wall of flat screen TVs playing The Wizard of Oz and entered the "Emerald City". 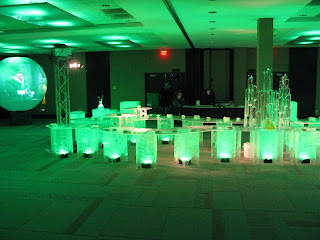 Crowne Plaza Glen Ellyn-Lombard's ballroom had been decorated with green crystal centerpieces, glowing green bar tables, an ice scupture carved to look like the Emerald City, and a curving, white table dotted with bite-sized versions of Glen Prairie's dishes. 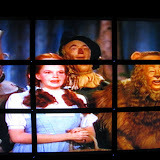 A mist rolled across the floor as music played and scenes from the Wizard of Oz were projected on huge orbs. It was a sight to see and a hotel to celebrate! We already know that Chicago is swiftly becoming a culinary hotspot for foodies and chefs world-wide, and while New York may claim that they take their coffee more seriously, Chicago is definitely taking the lead in the gourmet coffee world by welcoming the first Espression by Lavazza in America to our gorgeous city in November 2008. Where can you get expressive at Espression? Why, at the always glamorous Drake Hotel, located at 140 E. Walton Street at Michigan Avenue. To Eat at Espression: choices include a Brie and prosciutto panini with fig and tangerine marmalade, hearts of artichoke salad with shaved Parmesan drizzled with passion fruit dressing and a smoked salmon caprese salad. 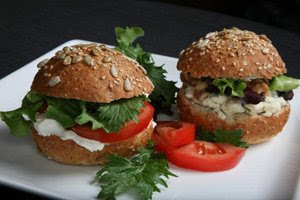 Good to know: all salads and sandwiches are made fresh to order and served at the table on porcelain plates. The breads, muffins, croissants, cookies and more are baked on-site daily. 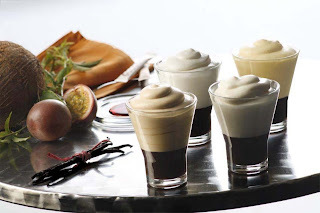 To drink: Innovative and exclusive offerings featuring Lavazza's espresso and various gourmet accoutrements. Be sure to taste the Espesso™, a solid espresso created by culinary mastermind Ferran Adrià, which was awarded Best Invention by Time Magazine. The mousse-like treat will arrive in Espression by Lavazza at the Drake Hotel and is available in espresso, cappuccino and macchiato flavors. We may be the "second city", but we've got the only Espression by Lavazza in America at the moment. Coffee and foodie fanatics: book your flights now because this one's a must-try. The tickets to Chicago are far cheaper than Italy and the experience at Espression by Lavazza in the lovely Drake Hotel will have you believing you're in Venice; just don't mistake the Chicago River for the Grand Canal. Walking into Eve (840 N. Wabash, Chicago; (312) 266-3383) the brand new restaurant by the same team behind Tallulah (4539 N Lincoln Ave, Chicago; (773) 942-7585), is like walking onto a glamorous old Hollywood movie, somehow transported to 2008. The decor is heart-stopping; as the most beautiful shade of blue becomes complimented by mirrors, and dotted wood tiles create a whimsical champagne-bubble look. This is a restaurant to feel beautiful in. What makes Eve stand out from all the latest restaurant ventures, is the attention to details. Every tiny detail in Eve, from the leather table cloths, to the black and creme chairs, to the dark wood floors, to the black napkins, to the unbelievable cocktail list incorporating "eve" in every title, to Chef Graves' food - oh! the food- displayed beautifully on gray menus in lovely script, belong together in the grand scheme of all things amazing. 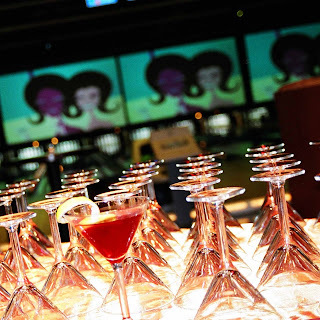 To dine at Eve is an event for the senses. Grilled Lobster Sausage (yes, sausage) with Chantrelles, Apple Wood Smoked Bacon, Pearl Onion, Maple Bechamel ($16); Spicy Pomegranate Glazed Prawns (all other prawns shall hence forth be embarrassed by their inadequacy) with Pumpkin Panna Cotta ($11); Steamed P.E.I Mussels (refreshingly sweet and light) with Honey, Ice Wine , Radish, Concord Grapes ($10); and Duck Consomme (unbelievable) Duck, Rillete Pot Sticker, Green Papaya, Lemongrass Essence ($11). Crawfish Po’Boy featuring Tasso Ham, Fried Green Tomatoes, Goat Cheese, Remoulade, Pickled Okra ($13), draped dramatically with a shard of leafy greens; Crab Blt Crab Salad, Pancetta, Leaf Lettuce, Sun Dried Tomato Aioli, with a Roasted Garlic Polenta ($14) that will change your life; Eve Burger (massive and rich served on a buttery brioche bun) 10 oz. Prime Beef with Brie, Port Onions, Stone Ground Mustard, Hand Cut French Fries, ($12); and last but certainly not least, Truffled Tagliatelle served with Tuscan Kale, Woodland Mushrooms, Grana Padano, ($14) - rustic, earthy and surprisingly light. Lunch at Eve, is in a simple phrase, "So good, you cannot even talk." And honestly, in between bites and genuine love being expressed for the food plated before us and the room surrounding us, we were speechless. Eve will be opening officially for dinner on November 5; lunch has already begun. All photos by Cindy Kurman. The first "green" Crowne Plaza hotel opens its doors today. The grand opening celebration of the Crowne Plaza Glen Ellyn-Lombard (1250 Roosevelt Rd., Glen Ellyn; 630-629-6000) begins today at 4:30 p.m. Guests will celebrate the hotel's commitment to environmental sustainability, including the hotel's recycling program, insulated low-E glass windows, CFL light bulbs, energy-reducing multistage boilers, use of regional vendors, hybrid guest transportation, and much more. Guests will enjoy chances to win tickets to "Wicked" in Chicago, overnight packages at the Crowne Plaza and complimentary dining at the Crowne Plaza's adjacent restaurant, Glen Prairie. City officials from Lombard and Glen Ellyn will lead the ribbon-cutting ceremony at 5:15 p.m. This unique, gorgeous hotel is a bright addition to Glen Ellyn and the landscape of the western suburbs. For more information on the Crowne Plaza Glen Ellyn, please visit: http://http//www.ichotelsgroup.com/h/d/cp/1/en/hotel/chige;jsessionid=UX5ZFNMAKWKCCCTGWAJCIIQKM0YBUIY4?_requestid=1366681. In case you missed it, our own Dr. Sandy Goldberg, accompanied by good friend Dr. Virginia Bishop, stopped by WGN's Adelante recently to discuss something near and dear to her heart: A Silver Lining Foundation (ASLF). More specifically, the ladies discussed ASLF's important mission and the recent health fair the organization co-hosted (along with Banco Popular) at Roberto Clemente High School in Chicago's Humboldt Park neighborhood. The health fair pre-qualified women for no-cost screening mammograms, and provided families with no cost health screenings, educational information and outreach services, breakout sessions, and a “day spa” featuring complimentary manicures, chair massages, haircuts and skin care demonstrations. It was truly a successful day--more than 400 people attended the health fair! ASLF proudly qualified more than 60 people for no cost screening mammograms. To view the Adelante segment, press here: http://www.youtube.com/watch?v=nllh-Kl3ezI. For more information on A Silver Lining Foundation, please visit http://www.asilverliningfoundation.org/. Get updates and other information by visiting the organization's blog at http://asilverliningfoundation.blogspot.com/. Be the first to try Eve! Eve Restaurant opens today for lunch, 11 a.m. to 3 p.m. at 840 N. Wabash. Eve, by the same team that brought you Tallulah (4539 N. Lincoln Ave.; 773-942-7585) last year, features a contemporary American menu with lunch options like Spicy Pomegranate Glazed Prawns with Pumkin Panna Cotta; Roasted Turnip Puree with Celery Root and Rosemary Creme Fraiche; Hoisin Glazed Pork Belly with Cucumber, Green Papaya, Butter Lettuce, Cashew Butter and Sesame Noodles and a Foie Gras Burger with Prime Angus Beef on a Bacon Cheddar Bun and Hand Cut French Fries. 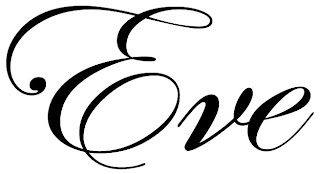 Eve will also be open for dinner starting on Wednesday, November 5. Dinner entrees include Truffled Celery Root Ravioli with Sunchoke, Baby Carrots and Herb Brown Butter; Rack of Lamb with Sheep's Milk Ricotta Dumplings, Swiss Chard, Crispy Garlic and Lamb Ragout; and Pistachio Crusted Ahi Tuna with Brussels Sprouts, Lima Beans, Blackeyed Peas and Huckleberry Compote. Still saving that favorite bottle of wine? Every Wednesday at Eve will be BYOB (with no corkage fee). 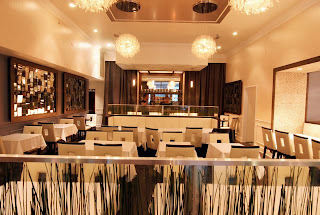 To make a reservation at Eve, call (312) 266-3383 or click here. If you were out with friends or having a late dinner Friday night, you may not have seen MORE featured on Chicago's ABC 7's "Hungry Hound." 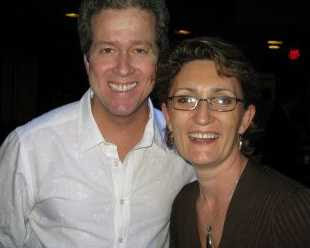 Steve Dolinsky interviewed owner Patty Rothman (sporting her "Want MORE" t-shirt) about MORE's sweet and savory cupcakes. According to Rothman, the BLT cupcake seems to be the fan-favorite, and Dolinsky himself is a supporter of the Mango Coconut cupcake. In case you missed MORE on the "Hungry Hound," you can watch the whole segment on ABC 7's Web site, here. 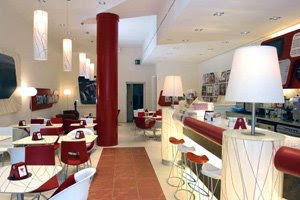 MORE offers a rotating menu of more than 50 flavors. Cupcakes range from $3.50-$4.25 each, plus flights of "MOREsels" (mini cupcakes) are available daily. Some of MORE's newest flavors were highlighted in the Chicago Tribune's "At Play" section last Thursday. Check the story out here. 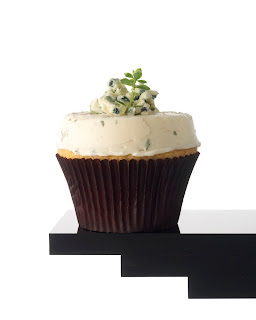 Although the Web version doesn't quite have the same effect without the larger-than-life size photo of the BLT cupcake that was published on the front page, the new flavors are sure to please! MORE is located at 1 E. Delaware Place at Delaware and State. For more information, call MORE at (312) 951-0001. As a breast cancer survivor, Dr. Sandy Goldberg understands the need for immediate and thorough care. Goldberg, founder of A Silver Lining Foundation (ASLF), which provides no cost screening mammograms and other breast cancer resources to uninsured and underinsured women, will host the ASLF and Banco Popular 3rd Annual Health Fair on October 25 from 10 a.m. to 2 p.m., at Roberto Clemente High School, 1147 N. Western Avenue in Chicago. 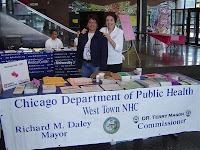 Held in the heart of Humboldt Park, the health fair will pre-qualify uninsured and underinsured women for no cost screening mammograms, and also provide no cost health screenings, educational information and outreach services, breakout sessions, and a "day spa" featuring complimentary manicures, chair massages, haircuts and skin care demonstrations. All services and educational brochures are offered in both Spanish and English. Area residents and families are encouraged to attend the fair to benefit from these services. The Roberto Clemente High School ROTC Drill team will perform and members of the Chicago Fire Department’s Fitness Team will guide health fair attendees through a fun workout and exhibit. No charge for attendance. 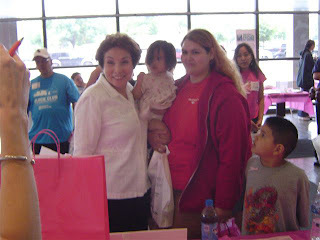 For more information on the Health Fair and on ASLF, visit http://www.asilverliningfoundation.org or call (312) 345-1322. 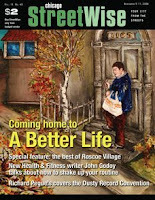 StreetWise will begin a new life as a full-color glossy magazine on November 5. StreetWise—and the 200-plus vendors selling it—have become a fixture in Chicago, and StreetWise, a 501(c)3 not-for-profit organization, is keeping ahead of the curve in a time of growing economic challenge. The new format and new content directly addresses the need to help the growing number of homeless people in Chicago and the suburbs. "Our theme for the launch is ‘A Better StreetWise, A Better Life,’" said StreetWise’s executive director, Michael Speer. "It’s a great move forward for us and we have great hopes for the new format. During the past 16 years we’ve helped thousands of people who otherwise would have had no means to earn a living. The new StreetWise will be even better than before and we expect it will become a must-read for many Chicagoans." The goal is to increase readership, revenue, donations and involvement at a crucial time when economic distress and homelessness are on the rise. Many Chicagoans don’t realize that StreetWise vendors are entrepreneurs who buy the publication at a wholesale price and sell it at the retail price on the streets. As a full-color glossy, StreetWise must raise the price to $2 per issue (it has stayed at one dollar for sixteen years) and the vendors, who will pay a higher wholesale price for the magazine, will nonetheless have the opportunity to earn more per issue. The new $2 price will help StreetWise provide new programs for its vendors and move the organization toward self-sufficiency. At the same time, StreetWise will launch it's new website. Streetwise will commemorate its new life as a magazine with a "A Better StreetWise, A Better Life" celebration and fundraiser to be held 6 p.m.-11 p.m., Wednesday, November 5 at the popular jazz club CloseUp2, located at 416 S. Clark Street. "Everyone is behind StreetWise," said Frank Goss, general manager of the club. "We are pleased to be a part of the new StreetWise and we’re informing our lengthy mailing list about the event." Chicago’s own rising star, contemporary jazz saxophonist Ray Silkman and his band will be the featured performers, with sets at 7 p.m., 8 p.m. and 9 p.m. Other noted contemporary jazz artists include Kurman's Lee Alec Barrie, will appear on stage as well. The minimum donation is $25 at the door with a cash bar and complimentary buffet. Space is limited, guests are encouraged to RSVP to StreetWise by November 1 by calling Ben Cook at StreetWise, (312) 829-2526, or sending an email to bcook@streetwise.org. If you'd like, you can purchase tickets in advance, online through Paypal by going here. To view the StreetWise press kit, go here. Kurman Communications, Inc. has been instrumental in helping -- from conception to implementation. Both Lee and I were enlisted two years ago to analyze the existing product, make recommendations and help plan for a successful transition. We've had a lot of help -- from the McCormick-Tribune Foundation, to an editorial advisory board, from Columbia College marketing students to hundred's of readers who offered their input. For those of you who may not know, Lee, who now sits on the StreetWise board along with other commited Chicagoans, spent 12 years in the New York magazine business helping titles like Good Housekeeping, Esquire, Cosmopolitan, Golf Digest and many others in transforming their editorial workflow and production to digital for prestigious companies including the New York Times Magazine Group, Hearst Magazines, and Times Mirror Magazine, as well as Miller Publishing and CMP Publications. 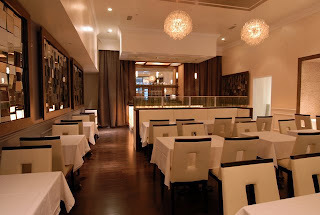 Birch River Grill (75 W Algonquin Rd, Arlington Hts, IL; (847) 427-4242) (BRG) has the lovely look of an upscale wintry snow lodge. It makes you just want to park yourself on the plush seats and eat till your heart’s content. Order the Rock Shrimp Scampi Linguini ($16) and try not to relive Lady and the Tramp’s pasta scene with your loved one. 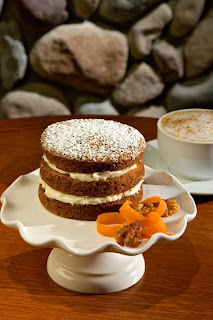 Save room for the Aunt Aggie’s Carrot Cake for Two ($10) – BRG’s signature dessert. A 3-layer carrot cake with cream cheese frosting and candied walnuts served on its very own pedestal. Can you say: adorable? Deerfields Bakery (3 locations: 813 N. Waukegan Rd, Deerfield; 201 N Buffalo Grove Rd, Buffalo Grove; 25 South Roselle Rd, Schaumburg) is a fantastic spot for all those Sweeties with Celiac Disease; Deerfields specializes in all things delicious, from chocolate croissants to cakes to deli salads but they have a special line for Gluten-Free goods, such as cookies, cakes and pastries. People with Celiac Disease deserve sweets too! Dine (733 W Madison St Chicago, IL; 312-602-2111) in downtown Chicago, is a classic American eatery, with a decidedly glamorous style. Indulge in the Daily Selection Cold Water Oysters ($13), a time-honored aphrodisiac, served with Appropriate Garnish. Also on the menu is the Portobello Mushroom Ravioli ($15) in an Herb Broth, with Sweet Peas and Parmesan. 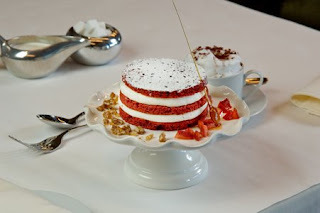 Gracie's Red Velvet Cake, layered and large enough for two, is a gorgeous dessert; Cream Cheese Frosting, Pecan Praline, and Vanilla Scented Strawberries are all amazing on their own, but together, they are perfection. Karma (510 E Il Route 83, Mundelein, IL; 847-970-6900), an upscale Pan-Asian restaurant, sporting a very modern and romantic flair features a Sticky Five Spice and Honey Glazed Spare Ribs appetizer ($9) served with Sweet Potato Matchsticks. 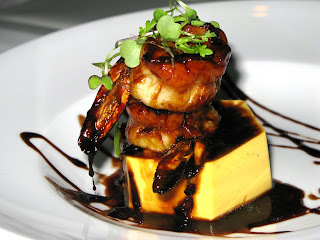 This sweet and spicy starter, with layered textures and tastes, is sure to get the heart beating. 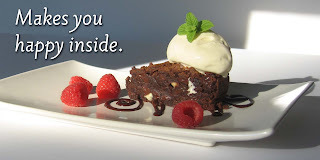 The Chocolate Moelleux Cake ($8), accompanied by minted cream and red current coulis, is a satisfyingly sweet way to end the romantic evening. MORE (1 E Delaware Pl, Chicago; 312-951-0001) is a chic boutique cupcakery that looks like a jewelry store, but instead of diamonds, this spot dishes out gems of cupcakes. 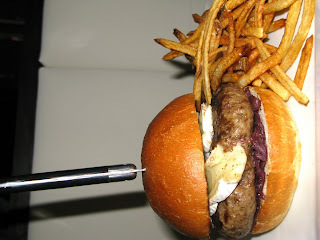 The flavors are meals in themselves: Fig, Blue Cheese and Port; Valhrona Chocolate, Crème Brulee. If your Sweetie can be somewhat salty at times, bring home a Salted Caramel cupcake ($3.50), Moist vanilla cake surrounding an eruption of buttery salted caramel, blanketed by a silky caramel Italian meringue buttercream, garnished with black lava salt. Tallulah (4539 N. Lincoln Ave., Chicago; 773-942-7585), intimate and lovely, Tallulah is a fantastic date place. Order the Red Wine Braised Pot Roast ($19), served with Braised Leeks, Mashed Parsnip, and Chervil Jus and wait for the apple of your beloved’s cheeks to get all rosey from the red wine. A must for Sweetest Day dessert would be the Ancho Chile and Chocolate Mousse ($7) with Roasted Banana Bisque; it’s hard to beat spicy and sweet. Nothing good to watch on Saturday Mornings? How about taking a break from the cartoons and checking in on issues that matter. This Saturday's edition of Adelante Chicago on Chicago's WGN - 9 will feature A Silver Lining Foundation's Dr. Sandy Goldberg and Northwestern University's Dr. Virginia Bishop, who also has a private practice in Pediatric and Adolescent Medicine. Hosted by Lourdes Duarte, the doctors will discuss the raising awareness of the need for mammography and address areas of resistance to testing in Chicago’s Spanish speaking community. Be sure to check the show out, or set your Tivo's and DVRs for Saturday morning, October 18th at 6:30 a.m. Although this half-hour show focuses on the Hispanic community, the information Dr. Sandy and Dr. Bishop will discuss is universal – going beyond heritage or ethnicity since breast cancer can affect family and friends, neighbors and people you have not yet met. Take the initiaitve and learn some facts from two women who work tirelessly to get the word out on fighting breast cancer. Sometimes, taking the first step in preventing breast cancer and illness is as easy as visiting your local high school. On Saturday October 25, A Silver Lining Foundation will host their 3rd Community Health Fair at Roberto Clemente High School (1147 North Western Avenue, Chicago IL 60622). Sponsored by Banco Popular, this popular community outreach event welcomes everyone. No cost testing of various types are available including pre-qualifying for no cost screening mammograms. Sounds like a great day to take care of yourself! Yesterday, Deerfield Bakery's gluten-free baker, Lisa Albertson, demonstrated how to make her tasty gluten-free Halloween sugar cookies on WGN-TV's midday news. With the help of anchor Micah Materre, Lisa showed how easy it is to make the cookie dough and decorate the sweet treats with natural organge icing and chocolate ganache. Deerfields' gluten-free treats are the perfect solution for those on a gluten-free diet looking for tasty, high-quality baked goods. Even people who aren't on gluten-free diets will enjoy these soft, tasty cookies. To celebrate Halloween, Deerfields is offering these Halloween cookies in individual 2-0z. packages for just $2.29 from now through October 31. You can even purchase Deerfields' gluten-free flour mix for $4.95 and use the easy recipe on the back of the package to make these cookies at home. 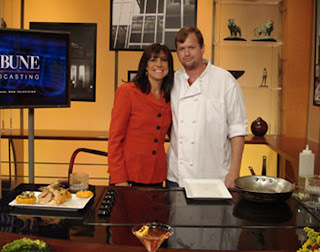 In case you missed the segment, you can view it here: http://www.wgntv.com/pages/video/?autoStart=true&topVideoCatNo=default&clipId=3029069. Micah loved the cookie she sampled. I was lucky enough to try one, and trust me-- these taste just like regular sugar cookies! 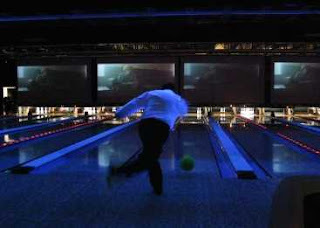 Networking can be stressful and sort of bland, but when bowling is involved - it's really a blast. 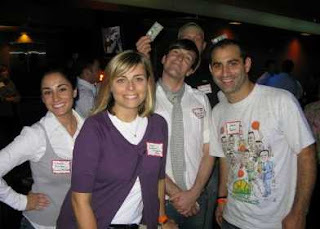 Kurman Communications joined many other River North companies including Rockit Ranch Productions, Chicago Home and Garden Magazine and North Bank at 10Pin Bowling Lounge (330 north state street, Chicago; 312.644.0300) for River North Association's (RNA) Speed Networking night. We laced up our stylish bowling shoes (really, no joke) and headed to the lanes. 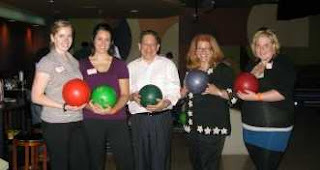 The lanes were filled with eager-to-bowl River North companies and Cindy Kurman, an RNA Executive Board member made the rounds, chatting it up with everyone in between bowls. Throughout the night there was a lot of laughs and strikes and exchanging of business cards. The RNA crew kept all of us focused on the task at hand - meeting new people - and made sure also that we were knocking the pins down and having a ball. 10Pin Bowling Lounge provided us with delicious pizza and drinks, great music and lots of time to bowl and chat. It was great fun to get out of the office, talk to new people and reach for that high score. Speaking of high score, Lee Barrie of Kurman Communications bowled a perfect game! Go Lee! 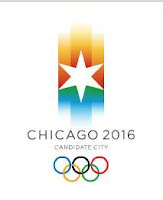 Find out how the 2016 Olympics will affect your business! Last chance. Register by Friday, October 17! Find out how the 2016 Olympics could impact your business! Gyata Kimmons, Director of Community Relations for the Chicago 2016 Committee has the facts and figures from past host cities to show you how River North will benefit when the games come to town. Hear his presentation on Wednesday, October 22 at the River North Association October Membership Luncheon to be held at the Holiday Inn Mart Plaza in the beautiful Wolf Point Ballroom. Registration starts at 11:30; Lunch is served at 11:45 with the presentation immediately following the meal. 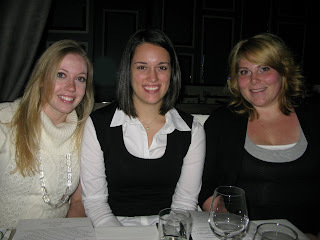 River North Association member tickets are $45, Non-Members - $55 or purchase a table of 8 at $325. No Walk-ins will be accepted. Don't miss out- make your reservations today! Click here to view registration form. Must RSVP by 3pm Friday, October 17. For all of you Bon Appétit junkies, here are two opportunities for some face time with the magazine's editor Barbara Fairchild. Please join Patty Erd and her crew at The Spice House in Old Town for a fabulous reception featuring tastings from the brand new Bon Appétit cookbook, Fast Easy Fresh - 1,100 Quick Dishes for Everynight Cooking. The reception begins at 6:30 p.m. and Barbara Fairchild will be with sigining books until 8 p.m. Here's your chance to chat with her about her recipes and writing. While the event is complimentary and sponsored by The Spice House, please do rsvp to 312 274 0378 or by email to spices@thespicehouse.com so that they can prepare enough goodies. Don't miss this special evening. A personalized book by someone of this caliber makes a brilliant holiday gift. For more infomation, please visit The Spice House website. For those who can't attend The Spice House reception in Old Town, Barbara Fairchild will also be appearing at the Green City Market in Lincoln Park on Saturday, October 18 from 9:30 - 11:30 am. For every book purchased there, The Spice House will donate $5.00 to the Green City Market. Come pick up a book and all the fresh, seasonal produce you'll need for delicious culinary inspiration. Birch River Grill (75 W. Algonquin Rd., Arlington Heights; 847-427-4242) features a Pumpkin Cheesecake dessert with Caramel Sauce and Whipped Cream, dusted with Cinnamon ($6). Dine (733 W. Madison St., Chicago; 312-602-2100) offers an Organic Beet Salad with Herbed Goat Cheese, Toasted Pumpkin Seed and Peppercress ($6), and a Pumpkin Cheesecake Tart, with Candied Pumpkin Seed Ice Cream and a Cinnamon Chocolate Sauce ($6). The newly opened MORE cupcake boutique (1 E. Delaware Pl., Chicago; 312-951-0001) is offering two Pumpkin Spice cupcake variations: a Pumpkin Spice cupcake with a Saigon Cinnamon Cream Cheese frosting, garnished with Housemade Cinnamon Candy Chards, and a Pumpkin Spice cupcake with a Housemade Marshmallow filling, frosted with a Cinnamon Glaze and garnished with Pepita Brittle ($3.50/each). Tallulah (4359 N. Lincoln Ave., Chicago; 773-942-7585) offers a Pumpkin Seed Crusted Fluke with Sweet Potato Puree, Boar Bacon, Tuscan Kale and Honey-Verjus Emulsion ($25), and Grilled Prawns with Stuffed Baby Pumpkin Chanterelles, Brussels Sprouts and Cipollini Onions ($21). 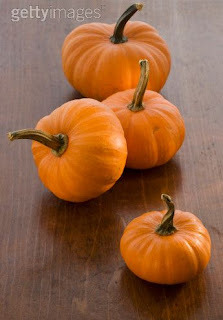 Not had enough pumpkin? October 21 marks "National Pumpkin Cheesecake Day," so be sure to check out Birch River Grill and Dine's variations on the tasty dessert! With superlative critical acclaim and a busy Lincoln Square restaurant under their belts, Tallulah's owner Matt Fisher and his executive chef Troy Graves are again teaming up, bringing their magical formula to the Gold Coast with their new restaurant, Eve , (840 N. Wabash) which will open October 27 for lunch, and a week later for both lunch and dinner. Three-star Tallulah, a romantically chic contemporary American restaurant that has received rave reviews, made it clear that the Fisher/Graves team have their pulse on what Chicagoans are seeking in an upscale, yet casual restaurant. Eve, which will be a bit more formal than Tallulah but still aimed at a casual-chic lunch and dinner crowd, will cater to the varied and sophisticated neighborhood population. "We love this area and jumped at the chance to open here," said Fisher. "The crowd is a wonderful blend of businesspeople, trendy shoppers and stylish residents, not to mention the large number of visitors who come here to be part of the scene." "The menu at Eve will have many similarities to Tallulah, but will offer some unique, refined twists," says Chef Graves, who will oversee the kitchens at both Tallulah and Eve. 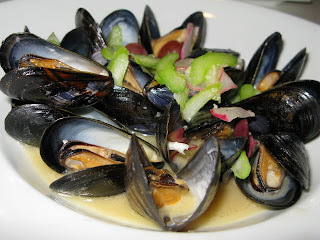 "We will focus on fresh, seasonal flavors and interesting taste/texture combinations. We draw primarily from a modern American palate but we bring Asian, Indian and Continental elements into play in a fun way." Look for dishes such as grilled lobster sausage with chanterelles, applewood smoked bacon, pearl onions and maple béchamel. 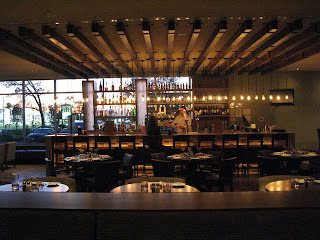 The restaurant will also feature many excellent, moderately priced wines by the glass. Eve 's décor will be airy and contemporary-soft blue-gray tones, reflective glass mosaic wall adornments, light flowing drapery and dark wood floors which will be offset by large ceiling to floor windows and crisp, white table linens and contemporary table settings. Guests will delight in the shimmering light fixtures that represent modern takes on the chandelier. The space, which has a capacity of 120 people, features a main dining room, a bar area in the rear, and a semi-private dining area off to the side that can be curtained off for private celebrations. There's also an intimate private dining room for up to 18 people. Next spring, alfresco table service for 40 will be added. Graves earned his culinary stripes as sous chef, then executive chef at Meritage before coming to Tallulah. He anticipates a strong lunch business, and is creating a lunch menu that will present many unique, quick-preparation dishes for people who enjoy excellent food, but have limited time. Eve, located at 840 N. Wabash Avenue in Chicago, will open October 27. Lunch will be served 11 a.m. to 5 p.m., Monday through Friday. Dinner will be served 5 p.m. to 10:30 p.m. beginning Wednesday, November 5. Dinner will be served until 11 p.m. on Saturdays and a limited menu will be served until midnight nightly. Eve will serve Sunday brunch from 10:30 a.m. to 3 p.m. beginning Sunday, November 9. Eve is closed on Sunday evenings.